So, Thanksgiving is once more upon us, the season in which where I work, little lines of boys and girls emerge from their weekly art lessons wearing paper Pilgrim hats and pictures of gobblers with enormous red wattles appear overnight on classroom doors and windows. In morning assemblies, children dress up as Native Americans and Pilgrims and retell the story of the Mayflower and its arduous crossing of the Atlantic in 1620, the story that we’ve taught them. All this seems eternal and unchanging, but these days, in addition to the books showing gleaming white Pilgrim faces breaking bread with bronzed and friendly Native Americans, we now in our schools read other tales to our children as the days grow shorter and November draws to its close. Many of them are the stories of children who decades ago would not have fit into the idealized Norman Rockwell images of Thanksgiving that those of us of a certain age grew up with. They are the stories of the new immigrants to these shores, the stories of the darker-hued peoples coming from the other continents: from Africa, South America, and Asia. Isn’t it just the same story all over again? 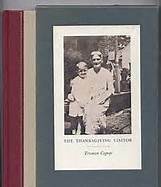 One of the most poignant of these “new” Thanksgiving stories, in my opinion, is a book written by Eve Bunting called How Many Days to America? It is the tale of a group of families fleeing from the soldiers of an unnamed country in either the Caribbean, Central America or South America. Though it is never explained, there seems to have been a change of government in this country and the times have grown troubled. The family in question has to escape in the night, leave most of their possessions behind, and pay unknown men a great deal of money to get on a boat of dubious condition. The young son of the family, together with his sister, watches as his mother hands over her wedding ring as part of the payment terms. And of course as soon as they are under way there are problems. The boat engine breaks down and they have to proceed under a sail they make themselves stitched together from the few clothes people had managed to bring with them. They are stopped and robbed by modern day pirates of the Caribbean. They try to land in another country, but are driven off by other soldiers (who then however relent and swim out to their boat to bring them fruit to eat). Finally, against all odds and just as they are beginning to lose all hope, the coast of America comes into view. They are allowed to land and kind people help them. They are brought to a great feast table heaped with food and invited to sit down with the other people to break bread, for they happen to have arrived on Thanksgiving Day. “What holiday are they celebrating here?” the little girl asks her mother. “It’s coming to America day,” her mother answers and the girl eats and is, for that moment anyway, at peace. And the point of all this is, they still come, don’t they, these modern-day pilgrims? Just like those original refugees, they still flee conditions, political, religious or economic, which are unbearable to them in their homelands and they try to get to a place where a better life might be possible for them. They continue to do this despite all the things that don’t seem to be working very well here in the America of 2012. For as the shortened day before Thanksgiving comes and we set our students their obligatory essays about what they are thankful for and chide the ones who yawn and shrug, we adults also can’t help but reflect upon our own situations: personal, national and global. Here in the United States, our country has just emerged from a bruising election battle which cost an obscene amount of money and has produced no obvious change in the forces opposing one another in Washington and throughout the country. The East Coast had just been battered by a storm of truly epic proportions which has left parts of New York, New Jersey and Connecticut looking like sections of London after the German Blitz. There is yet another fragile peace between Israel and Hamas in Gaza after days of fighting and the news from Syria remains grim and unencouraging. The economy is only slowly getting better and many people remain out of work. Europe, we just heard, has sunk back into recession. Oh, happy day! So what are we thankful for this Thanksgiving? As always, for the things which endure. For the people and places and animals we love. For our friends. For good books. For music and laughter. For the food on our tables and the warmth of our homes (those of us who have these homes and who have power in them). We are grateful for the trees that we can see outside our windows which have not been splintered by shelling, or swept away by the waves. We are grateful for the fact that we will never have to run in the night from soldiers or be forced from our country for political or religious reasons. We reflect that most of us, though we do not belong to the fabled 1%, nevertheless live amongst an abundance and comfort unimaginable in large swathes of the world. We reflect that we are spoiled. And we hope that this year certain things will improve: that more people will find jobs, that the coastline communities will recover. We hope that our government will get moving and that the weather will remain calmer. Some of these hopes are certainly vain ones, but where there’s hope, there’s life, and this, it is quite clear to all of us, is the main thing that we are thankful for. Linda, your lovely essay inspired me to learn more about Eve Bunting. She too is an immigrant. She speaks about her career as a writer of children’s literature in a Reading Rockets interview (http://youtu.be/5-xAtg5dqto), where she describes a few of her many other books. My question: when children encounter these poignant tales, to what degree does their personal background (as immigrants, as offspring of migrant workers, as religious minorities, etc.) determine their empathy for the fictional characters? If I imagine two children from radically different backgrounds (say a one-percenter and an immigrant) listening to you read from “How Many Days to America?”, how would their reactions typically differ? Or would they be substantially the same? I’m curious to know how it plays out in a real classroom. When I read these books to my Hispanic children, they understand them simply as reality, theirs, for they either came with great difficulty to the States themselves, or know others who did. One of my students from Honduras once told me her family had walked through Mexico to get here. I do not know if two children from radically different economic backgrounds might react to this story very differently and then to each others’ responses to it. Sadly, I think that in this, our 21st century America, the chances of these two children being in the same elementary school are slim to none. Our schools remain segregated by race and class. This is the reason that certain colleges pursue social and racial “diversity” in the way they do. An admissions director at Wesleyan University in Middletown, CT said to a group of prospective students this summer, “Wesleyan is probably the first and the last time many of you will live with such a culturally diverse group of people.” Unfortunately, I think he is probably correct.